Maria Rohm's escape through the streets of Kowloon terminates at a ferry pier along, fittingly, Ferry Street in Yau Ma Tei. 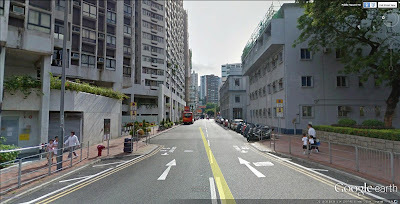 In fact there are two locations used in this shot, the first is this one Ferry Street, and the second one appears to be the Star Ferry Pier in Tsim Sha Tsui. A quick editing job makes it look like they are the same place. The older buildings along ferry Street seen below have long since gone, they were once part of the "six street slum" that was replaced by Prosperous Garden, but the Yau Ma Tei Police Station is still around for the time being and you can see it in the lower pictures where it sits along Public Square Street. We had a glimpse of this area when we were looking at Ferry to Hong Kong a couple of years ago, and in fact this jetty is the same one used for the berth of the ferry in that film. I keep banging on about how much this area has changed, especially with the creation of the west Kowloon reclamation (which basically filled in the old typhoon shelter). But pictures speak a thousand words, so here's the Streetview.